As we enter the final stretch for Kamen Rider Build, the endgame has finally begun. This episode begins with Evolt revealing his existence to the world, and only builds further from that jumping off point. Throughout this episode, tensions are high and there is a sense of finality, of ending to it all. Characters’ motivations and decisions are explored nicely, and without giving too much away, the show chooses to prove an ongoing fan theory correct in its final moments. The desperation these characters feel is palpable, fighting against what is easily the single most powerful enemy to ever grace a Kamen Rider series, or maybe even in all of Tokusatsu in general. Evolt’s challenge, issued to Team Build in the same broadcast in which he reveals himself, shows that he is still relaxed enough to think of their existential struggle as nothing more than a game. The fact that he caps off this performance by swallowing 20 square kilometres of the city in a black hole only reinforces Evolt as a cosmic-level threat. In all of Eastern superhero fiction, I can think of no character who even comes close to this level of destructive power. Team Build, for their part, put their desperation and determination on full display, as we see a glimpse of the Devil’s Scientist still living in Sento. His solution to defeat Evolt is to erase a parallel Earth using Pandora’s box, and let Evolt’s energy fuel the fusion. The result would kill or erase billions of people on both sides of the fusion, and nearly every other character, rightly, questions this plan. Still, seeing no other way, they proceed, and play into Evolt’s game. The game, as Evolt calls it, is for Team Build to enter the base of Pandora’s Tower and fight their way to the top. They don’t make it out of the first room before Grease is confronted by the ghosts of his past, in the form of Evolt-created clones of his dead friends. Despite seeing through the illusion and staying behind to fight, he is naturally hesitant to go all out. As the rest of the team moves forward, we are given contrasting shots of the action, and the multiple cinematic influences on the team behind the series become clear. The whole scenario seems to be drawn, in large part, from a classic action film from Indonesia called The Raid, known in the west as The Raid: Redemption, while Grease’s scenes parallel classic Westerns and Samurai films. It feels like a mix of The Magnificent Seven, Shane, and Rashomon. Like any classic Samurai or Cowboy, Kazumin faces this challenge with the steel and grit of a man who knows what needs to be done for the greater good, and has resigned himself to being the one to do it. If this is where Sawatari Kazumi falls, then it is a good end. This is a man who began his time in the series as a primary enemy, and became one of the hero’s closest allies. It would be a fitting end to his arc, all things considered. We will find out in Episode 47, and given the episode title and preview, it looks grim. What did you think of this week’s episode? Leave your thoughts and let’s discuss! Build vs Build continues this week as we learn more about the reasoning behind Katsuragi Shinobu’s decision to side with Evolt. Along the way, there is a lot of interpersonal drama, packed in between action pieces that show what Build’s basic forms could be capable of. 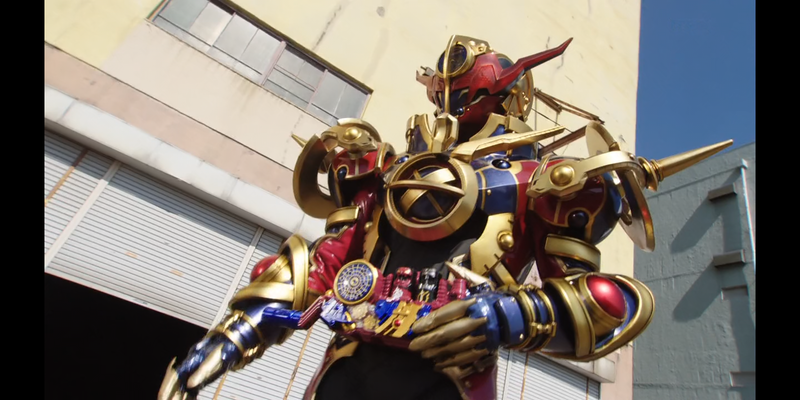 According to Shinobu, the Build Driver was originally built for him, and as such he has a better understanding of the basic forms than Sento ever did. He demonstrates this by nearly defeating Sento, Banjou, Kazumin, and Gentoku in a 4-on-1 fight. Also important to note is that, in this encounter, Sento and Banjou are both using their ultimate forms. Shinobu only survives the encounter because Sento intervenes and nearly kills Banjou in the process. Without Vernage’s healing powers, and with conflicting views on what to do about Shinobu, the group is more divided than ever this week. Banjou spends much of the episode comatose, while Gentoku and Kazumin scheme and plot on their own about what to do. The implication, at first, is that the two men would have simply let Banjou kill Shinobu, and erased a major player from the game. Sento, obviously, disagrees with this sentiment and insists there must be another way to get things done, even as he begins to truly doubt his faith in his mission for the first time. There is a certain degree of emotional intensity to the whole thing as Banjou lay in a bed, critically injured, and Misora reveals that she cannot heal him as she’d done in the past. In other words, no more mulligans. From here on, they are doing this for real, or not at all. There would be no second chances coming from Vernage’s powers, and Banjou could easily still lose control thanks to his newly-strengthened link to Evolt. Misora’s part in this episode is a large one, as she goes to her father with questions about Vernage’s power, only to become a Lost Smash using the CD Lost bottle. Sento is unable to save her by conventional means, in this case, due to the complications from the Martian queen inside Misora’s body. He learns this during another encounter with Shinobu, in which the seeds of doubt being sown lead to basic RabbitTank Build overpowering Genius form. Sento is left literally crying on the ground, before Banjou’s perfect timing allows him to tag in, motivate Sento, and save the day. After another short battle, the team figures out what to do, and the plan is put into action. A devastating finishing move leaves Shinobu thinking that Sento would simply kill two of his closest allies, if it meant keeping the bottle out of Evolt’s hands, only for Sento’s true plan to reveal itself when Banjou gets up and complains about the heat. Magma form does not make him immune to heat inside the armour, it seems, and as the flames fade, so do Banjou’s complaints, though Misora remains largely out of combat from here on. She is awake, she is herself, and Sento claims the bottle as an additional prize. At this point, he also reaches Hazard Level 7 and we see him take a gold Rabbit bottle. But with the new developments that result from this incident, including Vernage and Evolt now both being part of Banjou, what is to come next? 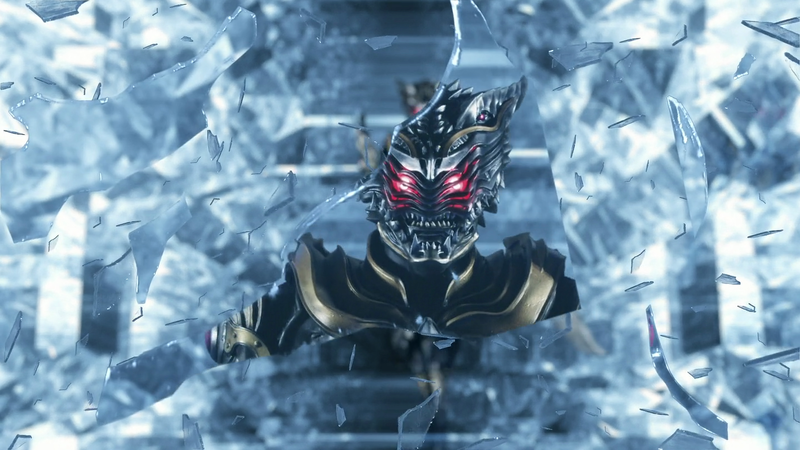 The preview for next week’s episode indicates that Episode 44 will be the end of the Build vs Build subplot, and this combined with Gentoku and Kazumin’s capture, will make for an interesting episode to be sure. What did you think of this week’s Build? Leave your thoughts below and let’s discuss! Build just keeps getting better every week and this time around is no exception. We begin where we ended, with Himuro Taizan being kidnapped by Gentoku at the end of the previous episode. When we join our heroes again, we are hearing a voiceover of a news report, while Banjou plays idly with Pandora’s Box, seemingly trying to use his Martian DNA to open it. He is thoroughly chided by Misora, and while the two of them discuss where Kazumin might be, Sento gets a call from Isurugi. He offers to exchange Himuro’s life for the Evol Driver, which was found and hidden by another scientist, Katsuragi Shinobu. 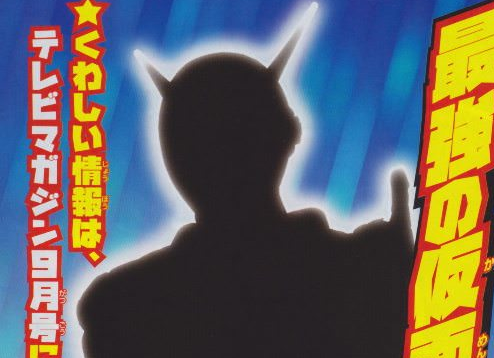 This new character is revealed to be Sento’s biological father, thus establishing a connection. The Build Driver was based on the Evol Driver, Stalk claims, and this is used as the in-universe explanation for the design similarities. As we cut between Team Build doing research and the father/son duo of Himuro Taizan and Gentoku talking, we see the true darkness in Utsumi manifest once again. 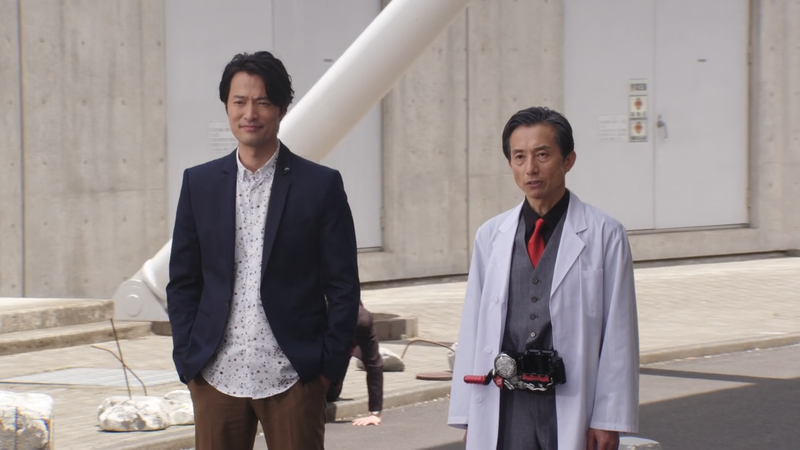 Personally, I’ve a feeling that Utsumi will end up being the ultimate master of the Evol Driver and the final endgame villain of the series, if not Nanba. Through flashbacks and dialogue, we are given the origin of the Drivers, and the story of how Pandora’s Box got to earth in the first place. A long-speculated fan theory is confirmed, and we see Isurugi talking to Evolt, the Martian entity living within him. All of Isurugi’s actions, up to this point, have been a result of Evolt’s influence, as it tried to manipulate Isurugi and other humans into recreating the Evol Driver. In a flash sideways, we see the light in Gentoku begin to shine as brightly as the darkness in Utsumi blackened the room earlier. Gentoku attempts to rescue his father, and is met by Utsumi, who once again flips the kill switch seen in previous episodes. With help from Himuro Taizan, Gentoku is able to overcome this weakness and enters the fight in the name of protecting what he cares about. This amount of character growth is excellent to see in any character, let alone someone who started as an edgy, angsty trope. Through Stalk, and ultimately Evolt, we learn that Genoktu’s aggression was greatly heightened by the light of Pandora’s Box, and the Nebula Gas experiment that made him a Rider dispelled this effect. 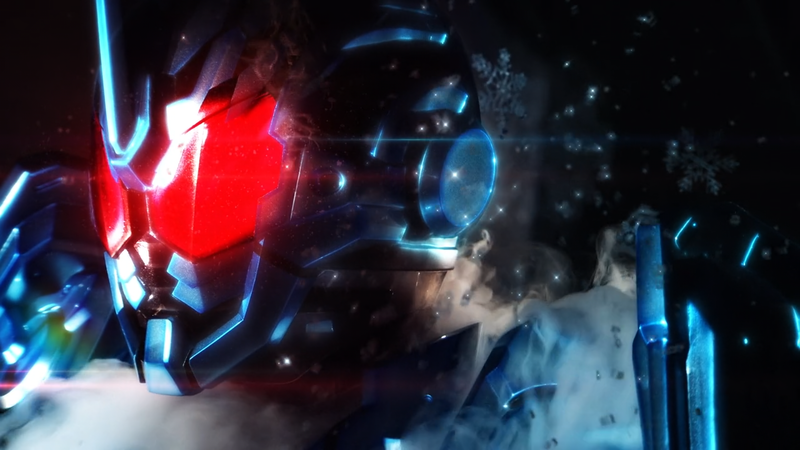 The Evol Driver appears in an unlikely place, and Sento begins to put it back together. This is widely regarded as a bad move, but he continues on anyway, and they go to meet Evolt to make the trade. Based on Utsumi’s prior words, they have no intention of honouring the agreement. Team Build goes anyway, though, and during the meet, Gentoku intervenes. The disabling chip no longer works, thanks to Sento, and Gentoku is free to stand with the other Riders in direct opposition to his former allies. 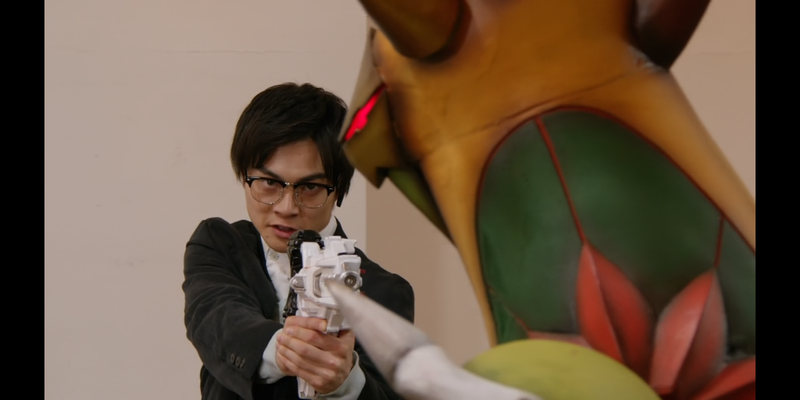 When Evol finally makes his debut, we see an ominous sign of things to come as Utsumi is the one to take the Evol Driver from Misora. After a dramatic, close-up transformation, we see Kamen Rider Evol make his entrance, using the Cobra and Rider System Evol Bottles to make up a form called Evol: Phase One. Per tradition when a new Rider debuts, he decimates the previously introduced Rider, Gentoku, and Himuro Taizan steps in between the pair as Evol’s finishing move connects. It’s a dramatic scene, as the former Prime Minister is blasted clean through by a sphere of dark energy, and the tension and sorrow between the father and son is conveyed very well. Gentoku gains a new purpose, or rather, a reassurance of his life’s work, as his father gives his blessing to unite the country. In the preview for the next episode, we see Evolt trying to recruit Banjou, while he takes on Sento more directly. 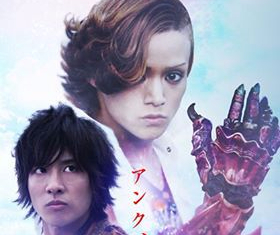 There is also a brief tease of a new form for Cross-Z, Banjou’s Rider form, using an Evol Bottle in his Driver. I am greatly looking forward to what’s to come as Build enters its final arc. What did you guys think of this episode? Leave a comment and let’s discuss! Prepare those wallets! May is upon us and that means Bandai have revealed all new toys coming out this month. Build has a lot of exciting things this month in the form of new belts and new bottles. First up is the DX Evol Driver. This new Build Driver remould/repaint will be out on May 12th in Japan. Being the main transformation device of Kamen Rider Evol, it comes with 2 Evol Bottles: the Cobra and Rider System Evol Bottles. As an added bonus, all of the previous Full Bottles will be compatible in the Evol Driver as well. You can pre-order it here for £84.99. That’s not it for Kamen Rider Evol as his additional Evol Bottle set will also be released this month. The DX Rabbit and Dragon Evol Bottle Set allows Evol to transform into a Rabbit Build themed Form and a Dragon Cross-Z themed form. This set will retail for this slightly higher than usual Full Bottle set price of £14.99. Get yours here. More Riders continue to arrive as the DX BatEngine Full Bottle set will hit Japanese shelves on May 12th. This set features a more traditional style Full Bottle look for Bat. These are also the final 2 Seito Bottles needed to complete the Seito Panels and the full 60 Full Bottle filled Pandora Box. Make sure you have enough Pandora Panels to accommodate them! This new Full Bottle set is the main transformation set for Kamen Rider Mad Rogue who also uses the Evol Driver to transform. Like other Full Bottle sets this set will retail for £12.99 and can be pre-ordered here. The Patorangers will gain their next mecha in the form of the Trigger Machine Crane and Trigger Machine Drill Set. These two mecha are able to combine with Pato Kaiser and are also comparable with Lupin Kaiser. Retailing for £24.99, this set will release on May 19th in Japan. You can pick one up here. Joining the fray this time around is the hotly anticipated new Ultraman series, R/B (Rube). Ahead of the show’s release in July, you can pre-order the show’s transformation device, the Rube Gyro, here. Very interesting month for the big three toku series in May… Stay tuned in June for Build’s final form and the new member of the Lupin vs Pato teams is revealed! What do you think of what Bandai has to offer this month? Are you going to pick any of these toys up? Leave a comment down below! Hello Tokusatsu community. Josh Perry here to talk about one of my favourite things from Toku and that’s Ranger Keys. Coming from Gokaiger back in 2011 Ranger Keys have been a major staple of the Super Sentai Bandai toyline ever since. While a new set has not been revealed since 2016, time will tell if this line has finally reached it’s end or if Bandai has something up their sleeve. Looking back at this line, let’s look at some of the things that make these little plastic Keys so special. Ranger Keys are highly collectible. Bandai struck gold when they came up with the concept of Ranger Keys. Having a series of toys that could double as action figures, display pieces, and unlock sounds (literally) is amazing. Bandai did not make it easy to collect the Keys though. With there being many different types from DX, Candy Toy, Gashapon, Promotional, and Premium Bandai, and over 400 Keys in total they really are a pain to collect. That can be part of the enjoyment, it can feel like receiving treasure when finding some of the rare Keys from the toyline. To add to that feeling there is a Gokai Treasure Chest you can use to store the Keys show accurately. There are so many Rangers in the Super Sentai universe. With there being so many Rangers not all of them get as many toys, or any at all, as other Rangers. This is a fate suffered by many of the movie exclusive and V-Cinema exclusive Rangers. Ranger Keys have gave these extra and 1 time appearance Rangers the representation they never had before. The line has gone from DekaGold, who appeared for only a few seconds, to X-1 Mask, the prototype Maskman featured in one episode, and many more. More recently with the release of the Lost Edition Key Set in 2015 Bandai used Ranger Keys to show the official design of Gosei Green who never had a helmet designed revealed before his Key. Ranger Keys are always nice on their own but one of the best things about them is how they look when they are all lined up together. The box for the Legend Edition shows a huge lineup of the Legend War from the beginning of Gokaiger. 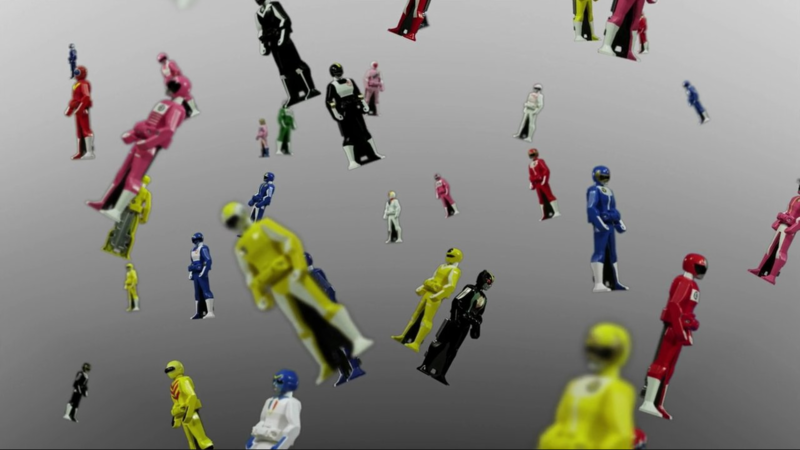 The figure style of the Ranger Keys allow them to be displayed with any other Keys and allow fans to recreate many of the team ups and battles from the Super Sentai universe. Bandai Japan has not been known to have long lasting or amazing line of figures for Sentai Rangers. Bandai America has also never been known to keep a line for a while and they have changed the scale of their figures all of the time in the Power Rangers line. But the Ranger Keys all follow the same size and overall basic template. Only difference n each one is the Ranger it is representing, the Key piece, and the stickers. This is another thing that allows the Ranger Keys to look great on the shelf display with every team having matching sized “figures” for each member of the team. Ranger Keys may be great display features or figures for a collection but what they are at the core are toys. As with all the other gimmicks released in the world of Toku Ranger Keys have lots of functionality with other toys. Of course the 2 Mobirates use them the way they are used in the show to transform into the Gokaigers or Gokai Change into any of the members from Super Sentai’s past. Other changers like the Gokai Cellular use the Keys more for an appearance rather then actual functionality, but they give the toy a complete look. Gokaigers’ weapons also use the Keys in great ways. Each weapon having the Final Attack have to be unlocked by a Ranger Key is a great play feature. Another amazing toy that the Ranger Keys can work in is the Super Sentai Robo. This toy is a Super Sentai Mecha cockpit that a team of Ranger Keys can sit in, which is a really cool display and play feature. Overall Ranger Keys are a gold mind of fun that Bandai Japan and Bandai America have gave us over the years. But I want to look into Ranger Keys on a more technical level. To see that be sure to check out the new all Ranger Key related series Ranger Keys: From Suit, to Show, to Toy. This series will cover the way Ranger Keys took a Ranger design, turned it into a Key for the show, and then went and turned that show Key to a toy version. Find this series on Toku Topics, starting on Friday May 4th 2018! What do you think about Ranger Keys? Do you own any in you collection? Leave a comment down below! Global scale with the Global Police! The episode opens on spring dawning. Keiichiro is out walking, bathed in cherry blossom leaves, and walks past a previously introduced antagonist, whom he plays off as just a weirdo. The Lupins, in their Bistro, are given the opportunity to meet and rob a famous French jewelry designer who may hold a Lupin Collection item while the woman visits Tokyo. A small, but impressive touch, is when the French woman is introduced and actually speaks French. Her Japanese companion talks to her, in heavily accented French, and she answers in kind, even if only for a few words. For me, this adds a certain amount of scale to the world, rather than having Japan seemingly contained in its own pocket dimension as it has seemed to in previous Sentai series, with a few exceptions such as Ninninger featuring an American ranger. The French woman, Ema, flees after being rescued from a Gangler by the Lupinrangers, and Kairi takes off after her to leave the fighting up to Touma and Umika. By the time the Patorangers intervene, Ema is already surrounded by Podermen. Later, she is met by Kairi, and reveals she speaks fluent Japanese. The item the Ganglers and the Lupinrangers are after is a memento of her grandfather, and she refuses to part with it, even after being offered a literal blank check. Ema’s sister has been after the pendant, trying to use it to get her to return to France. The Patrens, meanwhile, form a plan to lure Ema and the Gangler, Bletz, out. Tsukasa thinks of taking Ema into protective custody, the others of stopping the Gangler. Then we are given some background information on Ema, who ran away from her home in France when she was younger. This leads to Kairi having a flashback of his older brother playing basketball, growing up to do the same himself, and failing where his brother succeeded. Ema describes an inferiority complex, illustrated by Kairi’s memories, and he admits he understands her pain. Kairi is full of regret as he tells Ema to hold onto her sister and make up while she can. Later, as Ema listens in from around the corner, she overhears the Lupinrangers planning, and we cut to the gallery where Bletz wastes no time in trying to take the pendant. The Patrens are undercover at the gallery, and spring the trap as expected. Kairi goes his own way, following Ema, and Ema admits she knows that Kairi is a Phantom Thief. They discuss his reasoning, briefly, before he is forced to step in between Ema and Destra. Destra confirms Ema’s pendant is part of the Lupin collection, and Kairi does not bother trying to hide as he transforms. Ema already knows, so what would be the point? This is another small but powerful gesture on the part of the writing team, who seem to be paying very close attention to the world building and consistency of characters. After being rescued, Ema gives Kairi her pendant willingly, and Destra returns to the fight. Kairi uses the pendant to lure Destra away, and touches it to his VS Changer, where it becomes the Blade and Scissor Dial Fighters. After making a Kaiju, Destra disappears. Ema looks on from her hiding place with just a bit of longing. Then we cut back to more familiar, less story-driven action as the two teams overlap and Keiichiro goes all out. He launches a finishing attack, and in the dust and smoke kicked up, Bletz is destroyed, along with his Lupin Collection item. The weight of their failure is expressed in a great way, even through suits, as Touma and Umika process the results of the fight. Then the mecha battle begins, and we see Patokaiser enter the arena. The police are defeated, blinded by Keiichiro’s drive to capture Kairi, and Kairi uses the two new Dial Fighters to end the battle. Ema, on the ground, looks on and decides to call her sister. For this scene, her lines switch from Japanese back to French, consistent with her character and background. In the bistro, Kairi returns and is given the news. The episode cuts to a preview of next week, and we leave our heroes on a somber note. Overall, this episode is big on two things: emotional tension and its ability to let Kairi shine. There’s a big underlying message here about the value of family, even if it is not always apparent, and we get to see Kairi grow as a person while making a genuine connection with another human being in a grounded, believable way. Nine episodes into its run of what will become fifty or more, this entry shines as an example of everything this show could be. What did you guys think of this week’s episode? Leave your thoughts below! It was announced this past week that all of the UK and US locations of the toy store Toys “R” Us would be closing. This brought the end of an era for the toy industry. For many people Toys “R” Us was a huge part of their childhood. Growing up being a “Toys “R” Us Kid” and experiencing the feeling of walking into this store filled with toys as far as the eye could see. While Toys “R” Us has a huge legacy in is 70 years it also had a big impact on the Power Rangers toys. Walking into a Toys “R” Us, heading to the Power Rangers aisle and finding loads of the newest Power Rangers toys on the shelves. Every year around Thanksgiving there would be displays for the next season with all new toys, Megazords, figures, battle gear, and more. Of course, there would also be exclusives all over the place. 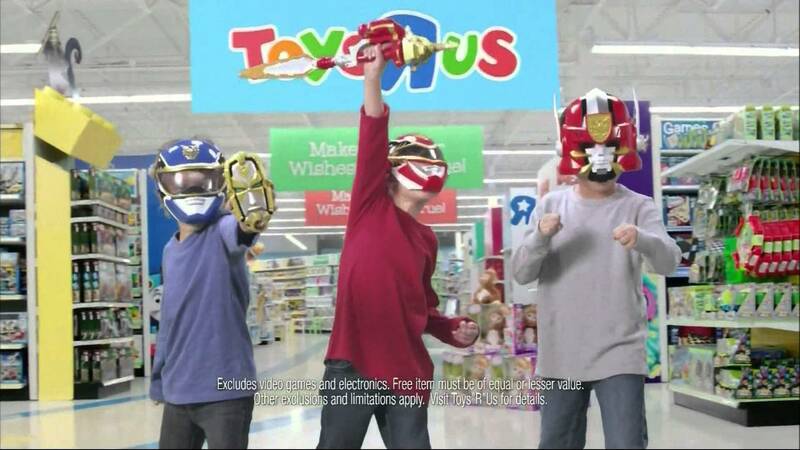 Ever since the beginning back in 1993 with Mighty Morphin Power Rangers, the toys have been sold at Toys “R’ Us. Over the years Toys “R” Us became the exclusive retailer for some Power Rangers toys and for the beginning of the Legacy line. 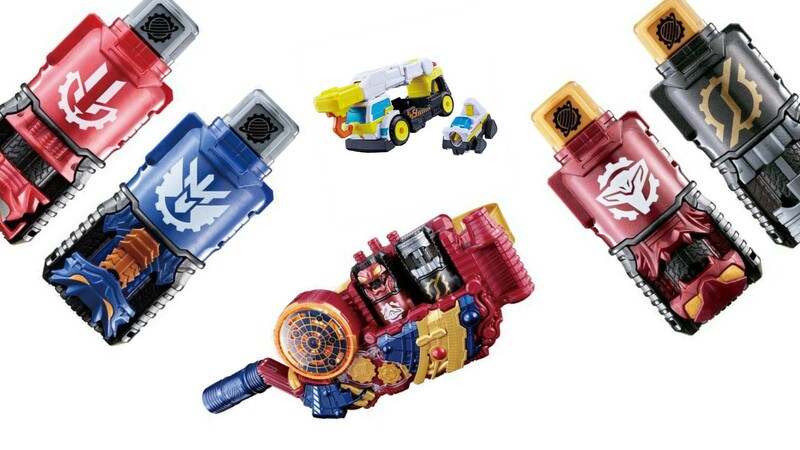 In the Samurai-Super Ninja Steel phase of Power Rangers many toys were sold exclusively at Toys “R” Us such as figure 6 packs, special hero sets, and big toys like the Lion Fire Fortress Zord. If there was a Power Rangers toy to be found chances are you could find it at your local Toys “R” Us. Of course, Toys “R” Us also became the exclusive retailer of late 2014, 2015, and 2016 Ranger Key Sets for Super Megaforce featuring the 6th Rangers, Extra Heroes, and many of the females. Dino Charger Special Sets for Dino Charge/Dino Super Charge was also sold exclusively. Toys “R” Us became essential to completing fan collections of these gimmick toys. One of the fan favorite Power Rangers lines, the Legacy line, also found it starts as Toys R Us exclusives with the MMPR Morpher and Megazord back in 2013. While these toys would eventually be re-released at different stores many of the Legacy line items started at Toys “R” Us. Even other parts of the Legacy line like the Legacy figures for the 2017 Power Rangers Movies were exclusives. The Toys “R” US exclusive logo was all over the Power Rangers toyline in the last few years. Now that this era is over what will happen to the toys that were usually exclusively for Toys “R” Us? With the recent news of the possible revival of KB Toys maybe they will head there? Time will tell, and between the news of Power Rangers going to Hasbro and the closure of Toys “R” Us things really do seem to be changing for both the future of Power Rangers toys and the entire toy industry. What were some of your favorite Toys “R” Us memories? What toys did you buy there over the years? Leave a comment down below! What do you think of this annoucement? What do you want to see in this set? Leave a comment down below!